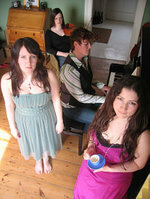 Listen to the detractors of Rachel Unthank and the Winterset and you get the impression that here is a band that is little more than a bunch of folk frauds, a sort of Girls Aloud that sees commercial mileage in throwing in strong regional dialect with a bit of folk in the hope of getting a novelty appearance on Top of the Pops. I was as interested as anyone to know more of the path Rachel and her sister, Becky, took into folk. FROM the music? OF the music? Mere hangers-on? You decide. And also have a look at Rachel's views on the Mudcat debate; she has seen everything from the bog standard "can’t sing for toffee" jibes to the "breath of fresh air" acclaim. And she's seen the stuff she describes, only slightly tongue in cheek, as "a bit vicious". What was your route into folk music? Indeed, do you regard yourself as a folk singer or is it more complex? How far, how high do you want to go? The route into folk music for Becky and I was indoctrination from birth much like Niopha‘s up bringing on traditional Irish music. Our parents love folk music and we have always been completely surrounded by it. Niopha had a similar experience with her Irish parents love of Irish music. We grew up performing in Addison Rapper and Clog team, travelling around the country clog dancing. Both of our parents sing too. My Dad is in a four piece unaccompanied folk group that sing shanties and folk songs, and my Mam has always sung in folk choirs. We always went to festivals, concerts, ceilidhs and folk clubs and I have a vivid childhood memory of sitting under a table in a singaround with my sticker book, secretly soaking up the stories and songs. There was a lot of singing in our house hold and it is still a key element of any family knees up. I do think of myself as predominantly a folk singer. I have also always been a music lover of all genres so it is a little bit more complex as I think this wider listening has also informed my singing. Wherever this journey takes us, as long as I’m still singing I’ll be happy. I’m passionate about being creative with folk music. My motivation is compelled by a commitment to traditional music and being excited by artistic possibilities, not by commercial success. I love that people seem to be enjoying what we do, it’s exciting, but if it finishes tomorrow there will still be our family parties to practise for. I’d like to think that me and Becks will still be harmonising together when we are old ladies, whether that be at the Albert Hall or in our living room. A Sunderland fan! A Macam (sic)! I shouldn’t officially be speaking to you at all! Mind you, most of my family are Boro supporters so I’m particularly tolerant on this front! As I’m sure you feel too, there is an enormous amount of pride related to coming from the North East. I think this may be because in some sense we are perceived as the back of beyond, deprived economically, socially and culturally, yet the people who live here have such a buoyant attitude. I think this may be because we have so much to celebrate too. Our beautiful and dramatic coastlines and countryside, our mighty industrial past, Hadrain’s Wall and the legacy the Romans left behind, Border Reivers, centre of religious innovation through Lindisfarne and of course, a football culture that draws together the pride and passion of its people (although the Toon Army is still the best!). The list is endless. It all lends itself to a very rich cultural heritage, songs of industry and agriculture, border ballads and sea shanties, great characterful song writers like the pit man poet Tommy Armstrong (to name but a one), a wealth of tunes, our very own Northumbrian pipes, clog dancing, rapper dancing and more. I’m proud of it all and to share it with others. Have you followed comments on the album in such places as Mudcat? What do you make of the reaction? I do try and avoid message boards as a rule, but you intrigued me so I had a look. Well, what can I say! People are truly divided, it’s quite unsettling to be the subject of such controversy! Some people obviously think we can’t sing for toffee whilst others think we are breath of fresh air!?! In our defence we do like a clashy harmony or two and enjoy bending the odd few notes. But who am I to say? As for the EMI debate, mmm I don’t quite get it. Maybe people aren’t aware that it only a licensing deal we have with them. We researched, recorded, produced our album ourselves on a limited budget and a vocal booth which consisted of our under the stairs cupboard. We have complete artistic control in everything from music to artwork and definitely pick our own frocks! I am tempted to think that some people in their internet universe may not be aware of the current fashions in the outside world, it’s not unusual for young women to wear frocks!! However, this is probably very judgemental of me, I shouldn’t join their ranks! Perhaps we should start wearing jeans and woolly jumpers on stage to look a bit more authentic. Quite seriously though, people might think that wearing posh dresses is about marketing and glamour, but with us I think it comes more from of an old fashioned, working class hang up of always wearing your best frock when in public, and by god if standing on a stage isn’t a good excuse to get your spangles out, then what is! As for Belinda, none of us wanted her to leave the band and EMI certainly didn’t push her out. She has been an important part of our soundscape and we’ve loved having her in the band. The creative process has always involved the five of us however (me, Becky, Niopha, Adrian and Belinda), and was never led by one individual. I’m sure our sound will change, but her departure won’t signify a sudden dearth of creative ideas. Just been back to Mudcat and it’s all turned a bit vicious!! I suppose reading these chat rooms is a bit like over hearing people talking about you in a bar. Sometimes it’ll be a pleasant experience, sometimes not. I think I might avoid them in future though. It’s a bit like they don’t think we are real people, just sport. It’s important not to believe the hype about yourself or the mud slinging if you are going to remain sane. We are really bowled over by the response to our album. We never envisaged it. It definitely doesn’t seem to be inspiring luke warm receptions, good or bad, which is exciting! We grew up in a little place called Ryton on the banks of the Tyne with parents, Pat and George, and brother Matthew. Matty plays fiddle and guitar very well, but is the only sensible member of the family, choosing a career as a mad scientist. I’m the eldest at 30, Mat 28, Becky 23. The 7 ½ year gap between me and Becky has meant that we have never been competitive and so have always got on. I went to Glasgow University for four years and have an MA Hons in History\Theatre Studies. Becky is taking time out from her degree in History of Art and Design at Manchester Metropolitan. Niopha has a degree in Folk Music from Newcastle University. No kids presently, though we both want them at some point, for me a little more imminently. At some point Becky’s going to go back to Uni and I’m going to have lots of babies. I’m also planning to get married later this year (woo hoo!) to previously mentioned Adrian McNally. I know! You should never mix business and pleasure. Oh well, too late for that. I’ve had loads of jobs, from spurious coffee houses, to being a theatre usher, distributing flyers, a friendly but incompetent bar maid (my manager kept assuring me that I should have been blonde!). My main focus in the past five years, apart from the band , has been teaching as a workshop leader, vocal practitioner and clog dance instructor in schools, mostly primary. I trained as a community musician with The Sage Gateshead and have worked on many projects with them, Folkworks, and local education authorities and music services, teaching singing, dancing and folk traditions in schools. I’m also a member of The Sage Gateshead’s early years team, delivering music workshops to children 0-6 and their parents, teachers and carers, which I particularly enjoy. I still do some of this work when I’m home. Becky’s had a few part time jobs in restaurants, a night club, and helping my Dad out with his Interior design business, but the band has been her main job. And tell me about Fareweel Regality. We all love this song, it sends tingles down our spines when we perform it and has been known to make grown men cry! It is written by Terry Conway, a singer of traditional songs and writer of wonderful ones, from Northumberland. My Dad has always sang his songs and ushered us towards this one. The title refers to the regalities and liberties of Hexhamshire which were areas of local jurisdiction that were passed between the Archbishops of Durham and York until they finally rested with Northumberland. There were special privileges attached to the title and I overheard Terry saying that one such privilege meant that if you were a villain on the run, being chased, and you got over the border into Hexhamshire then you were safe. This was because your pursuers had to get permission from whoever the regalities and liberties belonged to, and was so used as a bit of a safe place to hide out. I live within Hexhamshire now and it also makes me think of home, but it seems to be the kind of song that warms the cockles of your heart wherever you are from.